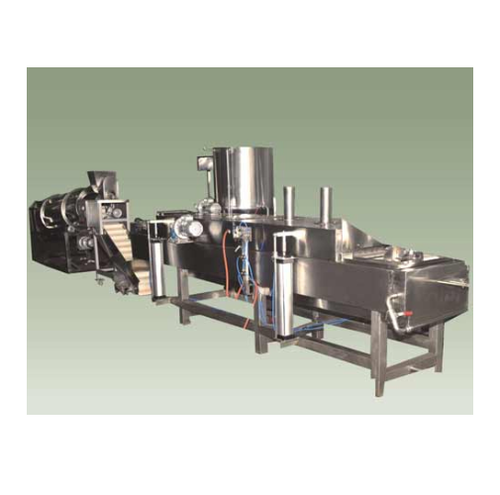 With the years of understanding and knowledge, we are indulged in manufacturing and supplying a high-quality Continuous Sev Extruder Machine. Raj Works & Industries established in the year 1971 is the manufacturer and supplier of quality Industrial Processing Machines. Designed in accordance with set industry standards and norms, our range comprises Grinder Machines, Herbs Grinder Machines, Chemical Grinder Machines, Namkeen Making Machines, Stone Separator and Disintegrator Machines. In addition to this, our expertise enables us in manufacturing a wide range of Industrial Mixer Machines, Concrete Mixer Machines, Ribbon Blender Machines, Coating Pan Mixer, Industrial Dryer Machines, Centrifugal Dryer Machines and many more. Sold and marketed under the brand Anant, the complete range is manufactured using optimum quality raw material and components. Supported by a team of expert professionals, we have been able to successfully meet the demands of the clients in diver industries. Moreover, to maintain the timeliness in each our delivery, we have developed an ultramodern manufacturing facility. Together with the in-depth product knowledge of our professionals and advanced machines, we have been able to offer a range that suppresses client’s imagination. Further, their expertise enables us in offering reconditioning and complete maintenance services of various machines to valued clients. It due to our quality products, ethical business practices and easy payment options including D/A, L/C, Cash, Cheque, Credit Card and demand draft, that we have gained huge client base across the nation.